Certified Instructor and Joimove Lithuania’s Representative Ruta Lelyte Ambrozaitiene shared her thoughts about her Joimove Training. Enjoy! When I decided that I could give dance classes for parents and their babies in carriers, I started to look for any possible training in this field. 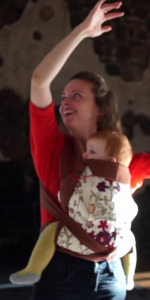 Even though, my dance teaching experience is more than a decade, I knew that babywearing dance requires some special knowledge and preparation, because I am going to work with very sensitive group: new moms and babies. Therefore my aim was to get a full package of knowledge of active babywearing, new moms and babies safety and about other important issues which I may meet in my babywearing dance classes. I was so surprised that there were not so many options babywearing dance training, actually, Joimove training was the only one which I found in Europe. So I had to decide if I go on my own as a professional dancer and teacher who experienced on dancing, therapy and babywearing or I can get everything I would need from Joimove team. And of course I chose Joimove, and it was a much easier, time and money saver way. Since then, I have never regret my decision. I found, live talks with Joimove’s founder Selen are an amazing opportunity. Online training sessions are super comfortable option, when you are at home with your baby, and live talks become that essential part of training which supports you and fills in all gaps of all risen questions, doubts and considerations what to do next. It is that service which opens me the best way to adapt all other services to my personal needs, because each country, city, class place and class participants has its own specificity and issues. At Joimove, I am always able to discuss any question which I have and get that support which helps me to continue and grow. In my opinion, on going support from Joimove is like any other support which you may get in your life: you may take it or not. If you are open to take and use it, you will get even more benefits than you have expected. So I think that Joimove can give me more than I am ready to take. Therefore I am very thankful for the support which first of all is based on a humanly contact, understanding and inspiring. I would recommend Joimove training, because you may get more than just a necessary knowledge. You also get a human relationship, a strong feeling that you are not alone. Because Joimove opens you an understanding that simple dance may work as a strong tool when you want to create something valuable and change the world.